The aim of this Roadmap is to set a vision and lay the groundwork to establish a comprehensive and far-reaching sustainable finance strategy contributing to the Agenda 2030 and towards the objectives of the Paris Agreement. 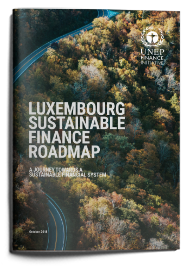 This Roadmap is ambitious in terms of Luxembourg’s contributions to sustainable development and climate action, it is forward looking in terms of future opportunities and challenges, and it is shared in terms of achieving buy-in from key public, private and civil society stakeholders. Commissioned by the Luxembourg Ministry of Finance and the Ministry of Sustainable Development and Infrastructure (Department of the Environment) and drafted in partnership with the United Nations Environment Programme (UN Environment) and with the support of Innpact, a Luxembourg-based specialist in impact finance. It contributes to the framework of the “Luxembourg 2030 – National Plan on Sustainable Development” of the Luxembourg government, the various commitments taken by Luxembourg at international level and is in line with the trend of leading financial centres’ efforts to boost sustainable finance.